Sterling Gun Drills supplies a complete selection of accessories for deep hole drilling machines. 5 and 15 micron filter elements for the Mega Flow deep hole drilling system. 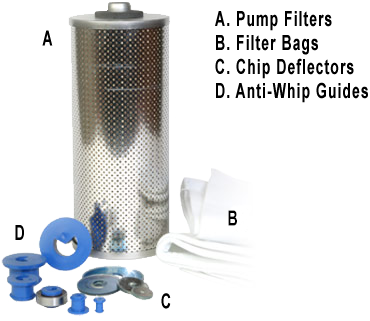 Removes particles too fine to be trapped by filter bags. (5" OD x 12 7/16" OAL x 25/32"). Upper and lower filter bags for the Mega Flow deep hole drilling systems. Traps larger chips and prevents them from returning to the tank. Steel faced chip deflectors keep oil and chips in the chip box. (Sizes from .075" to 2.00"). Molded vinyl guides provide support that prevents the gun drill's tube flute from whipping and bowing, permitting higher speeds without vibration. (Sizes from .075" to 2.00").